One week ago my girls provided the music for a friend's wedding. They had practiced for months in preparation. While they were playing, my mom reminded me that their music teacher advised never expect things to go just as planned at a wedding. I guess that advice could apply to marriage, too. Weddings always make me think of my own wedding, and this one with my husband and son sitting by my side was the same way. 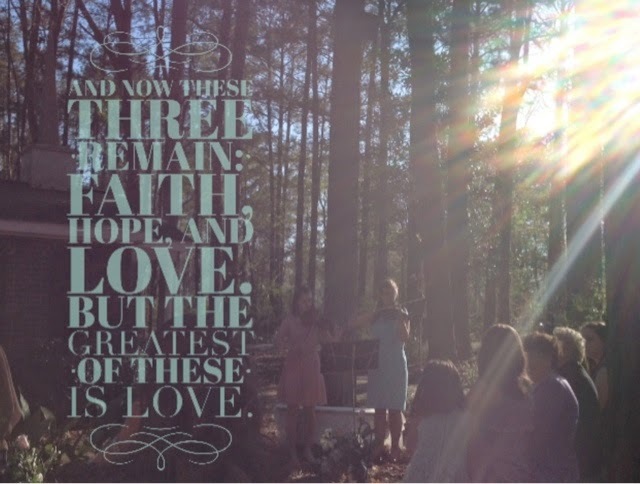 One of the passages of Scripture shared at our wedding was "the love chapter" from I Corinthians. "Though I speak with the tongues of men and of angels, and have not charity, I am become as sounding brass, or a tinkling cymbal. And though I have the gift of prophecy, and understand all mysteries, and all knowledge; and though I have all faith, so that I could remove mountains, and have not charity, I am nothing. And though I bestow all my goods to feed the poor, and though I give my body to be burned, and have not charity, it profiteth me nothing. Charity suffereth long, and is kind; charity envieth not; charity vaunteth not itself, is not puffed up, Doth not behave itself unseemly, seeketh not her own, is not easily provoked, thinketh no evil; Rejoiceth not in iniquity, but rejoiceth in the truth; Beareth all things, believeth all things, hopeth all things, endureth all things. Charity never faileth: but whether there be prophecies, they shall fail; whether there be tongues, they shall cease; whether there be knowledge, it shall vanish away. For we know in part, and we prophesy in part. But when that which is perfect is come, then that which is in part shall be done away. When I was a child, I spake as a child, I understood as a child, I thought as a child: but when I became a man, I put away childish things. For now we see through a glass, darkly; but then face to face: now I know in part; but then shall I know even as also I am known. And now abideth faith, hope, charity, these three; but the greatest of these is charity." If you would like to see it, click the link to a brief recording of them in Instagram. 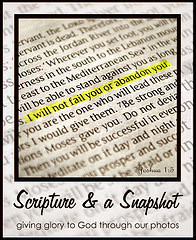 Thanks to Yvonne's suggestion, we now have a group Pinterest board for Scripture & A Snapshot. Please follow the board then let me know your Pinterest name or email used there if you would like to be added to it. Thank you for joining Scripture & A Snapshot. Leave a comment with a verse that God has placed on your heart this week, or leave a link to your own post sharing a Scripture and a snapshot. Take time to visit some of the other links, too. I love your picture! All that light looks so magical and I bet your daughters played beautifully too. Beautiful picture!! Such a privilege to be asked to share music for a wedding celebration. I'd love to be added to the Pinterest board, by the way. Thanks, ladies, it was beautiful and a privilege. The bride was a sweet girl who was their babysitter a few years ago. Gorgeous photo! What a blessing to have your girl's play at a wedding. They must be very good!